Once the cheering died on a perfectly glorious late summer Sunday at CenturyLink Field, though, the larger question could be whether it’s a good thing Seattle needed that sense of belief on this particular day. The Seahawks again demonstrated Sunday what coach Pete Carroll believes is one of their greatest strengths — belief. Down four points with 4:08 left against Miami and needing to move 75 yards to win the game — when the offense hadn’t moved that far on a drive all day long — Carroll sensed no panic, no worry. 66 Rushing yards for Christine Michael, tops for the Seahawks on Sunday. 112 Rushing yards by Seattle. The Seahawks averaged 3.5 yards per carry. 12 Longest rushing play by the Seahawks. And then the Seahawks turned belief into action, moving the necessary 75 yards to win the game. Russell Wilson overcame an injured right ankle suffered in the third quarter to complete his final five passes for 49 yards, including a 2-yard touchdown toss to Doug Baldwin with 31 seconds left to pull out a 12-10 victory. “That really is a great makeup of a team, to have that sense,” Carroll said of a Seahawks squad that now has pulled off 19 fourth-quarter comeback or overtime victories in the Wilson era. Once the cheering died on a perfectly glorious late summer Sunday at CenturyLink Field, though, the larger question could be whether it’s a good thing Seattle needed that sense on this particular day. The Seahawks entered the weekend as the largest favorite in the NFL at 10½ points. But the offense was surprisingly stagnant. 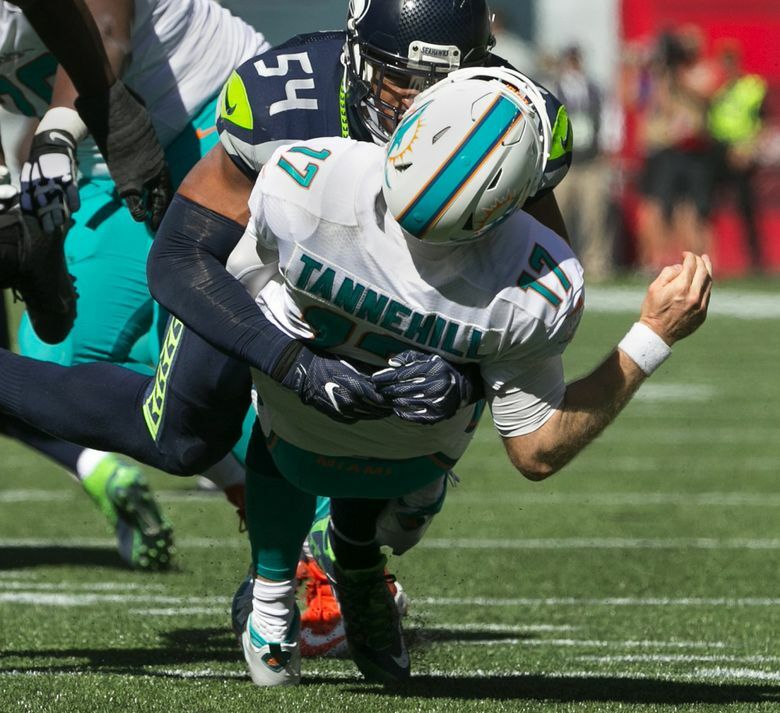 And although the Miami defense is littered with big names, it’s no one’s idea of the best in the NFL, and yet it had the Seahawks in danger of losing a home opener for the first time in the Carroll era. 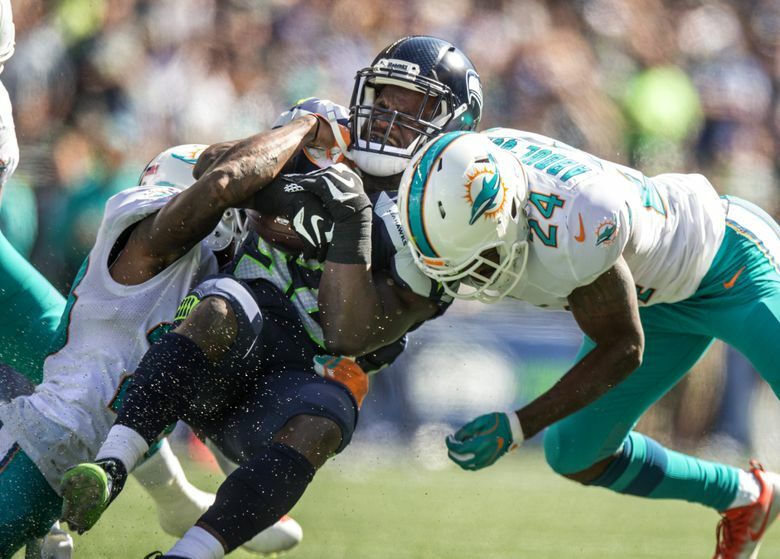 Seattle fell behind on Ryan Tannehill’s 2-yard run that capped an 86-yard drive, the only real pock mark on the day for the defense other than a couple of communication breakdowns, missed assignments and an uncharacteristically off day from Earl Thomas. At that point, the Seattle offense had run 11 drives, punting on six of them, losing the ball on turnovers on two others and turning the ball over on downs on another with the other two ending in field goals. Even before his injury, though, the offense hardly resembled the one that scored 29 or more points in seven of the last eight regular-season games last season other than in the fact that there were again a number of quick-hitting passing plays that seemed design to play to the strengths (or go against the weaknesses) of the offensive line. The running game, for so long the heart and soul of the Seattle offense, was far from intimidating, with the Seahawks getting 112 yards on 32 carries, with tailbacks Christine Michael, Thomas Rawls and C.J. Prosise combining for 94 on 28 attempts. Carroll seemed to put more of the onus for that on an offensive line that entered the season as the team’s biggest question mark. The line featured just one starter in the same spot as a year ago — right tackle Garry Gilliam — and which also had to make a change this week with J’Marcus Webb stepping in for an injured Germain Ifedi at right guard. The lack of a running game had Seattle throwing it more than ever. Wilson’s 43 attempts were a career high and the Seahawks had a 26-13 pass-to-run ratio in the first half, the most NFL passes Wilson had ever thrown in one half. Poor field position didn’t help — the Seahawks started only two drives outside of their own 25. Neither did penalties — Seattle had three holding penalties in the second quarter alone. “It just never got going,” Carroll said of the offense. 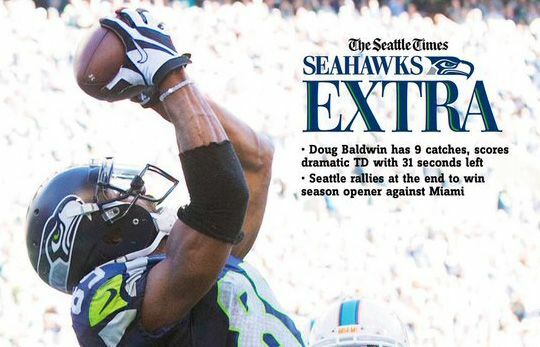 Actually, it did twice: when Seattle went up-tempo to end the first half and to end the game. Along with the final drive, the Seahawks used the no-huddle to move 72 yards in 10 plays to get in position for a field goal to end the first half. Add it up, and the Seahawks gained 147 yards on 24 plays on those two drives, 205 on 54 the rest of the game. Asked why the offense seemed to do better in the hurry-up, Gilliam compared it to driving a car at 100 miles an hour. Left tackle Bradley Sowell agreed the pace seemed to suit the Seahawks. Still, cornerback Richard Sherman wasn’t sure belief was all that powered the Seahawks at the end. “I think for the mistakes that we made and the holes that we kept digging ourselves into, it’s a blessing that we came out with a win,” Sherman said.